Let’s travel, as we did in last issue’s installment of this series, with Wally Bradley. In the summer of 1928, with his new folding 116-size Kodak camera in hand, Bradley made a point of journeying to some of the extreme reaches of Rochester’s street railway network including, in this case, Canandaigua. We can only hope he made the trip on one of the Rochester & Eastern’s fine interurban cars. Bradley’s quest, though, was the local cars running on that city’s Main Street from the lake pier to the north city line. At both ends of the two-mile line, the little cars would have a short layover before beginning another run through downtown Canandaigua. At the lake pier, connections could be made with Canandaigua Lake Transportation Company’s steamboats. A stop at the mid-point of the line was in front of the R&E station at the corner of Main and Niagara, at which point R&E riders could easily transfer to the local car. Car 307 had been originally built as an early single-truck passenger electric streetcar about 1891, numbered in the 200-299 series (probably). The car was lengthened to a double-truck version some ten years later, at which point it received its 307 numbering. Forty-four cars, 300-343, were so rebuilt from single-truck cars. By 1916, with the arrival of the 1200-1249 Peter Witt cars, the last of the 300s were retired from use in Rochester. Two lucky cars from this series, 307 and 326, were rebuilt and sent to Canandaigua in 1917 to relieve a few tired 200-series cars that New York State Railways, R&E 307	had been in use since about 1909. By the late 1920s, 307 and 326 had become Wallace Bradley photo among the oldest streetcars still in passenger service on the Rochester Lines of New York State Railways. It is no surprise that Bradley, having obtained a good camera, resolved to capture one of the “dinkey” cars in Canandaigua as soon as possible. On the day Bradley traveled to Canandaigua, probably about August, 1928, he may have ridden 307. While 307 paused at the layover point at the north end of the line, Bradley snapped this hurried photo. The car has had its end changed from its northbound trip and is about to begin its southbound run. The house in the background, still visible today, marks the location of the car as near the north city line. The focus of the photo is a bit off, perhaps because Bradley had not yet fully mastered his new camera. It is of little detraction to us at a vantage point of 77 years after the fact, as Bradley did indeed capture one of the rarest of all Rochester streetcar scenes. 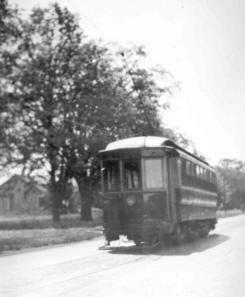 Just a few months after the making of this photo, the only known railfan photo of a Canandaigua local car in service, the ”dinkey” unceremoniously ran its last miles on or about December 1, 1928.